Paradeep is one of the Major Ports of India and is the main out-let and in-let of the sea- borne trade of the eastern part of the country spread over States such as Orissa, Andhra Pradesh, Madhya Pradesh, Uttar Pradesh, Bihar and West Bengal. The natural resources and industrial products of this wide spread hinterland are immense and the value of the Ore trade of the country passing through the Port of Paradeep is considerably higher than many other Major Ports of India. The foundation stone of the Port was laid by Pandit Jawaharlal Nehru on the 3rd January, 1962. The construction works commenced from the 19th November, 1962 and dredging operations started from the 15th March, 1964 by the Yugoslav Dredger "VLASINA". 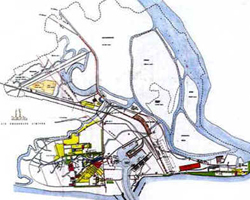 During this period, this Port was under control of the Government of Orissa. Government of India took over the management of the Port from the State Government on 1st june, 1965. The construction of the Iron Ore Berth was completed and INS "INVESTIGATOR" had the privilege of maiden berthing in the Port on the 12th March, 1966. The Port was declared open by Mr. Peter Stambolic, Prime Minister of Yugoslavia on the same day. Government of India declared Paradeep as the Eighth Major Port of India on 18-04-1966 making it the FIRST MAJOR PORT in the East Coast commissioned in INDEPENDENT INDIA. The Port was opened to traffic for Iron Ore in 1966 but after three decades, the cargo profile has undergone a complete transformation. It consists of not only Iron Ore, but also Thermal Coal, Coking Coal, Chrome Ore, Manganese Ore, Semi-processed Ore cargo like Charge Chrome, Ferro Chrome, Ferro Manganese, Limestone, Hard Coke, Ingots and Moulds, Billets and Steel materials, Dead-burnt magnesite, Scrap, Fertilizer, Food- grains, Reefer cargo, and Fertilizer Raw- materials eg. Phosphoric Acid, Ammonia, Sulphur, Rock Phosphate. The Port started handling containers and transhipment of Petroleum products in 1991. One berth has been earmarked for handling POL products.The varied nature of cargo handled bears testimony to the efficient and personalised services of this Deep Water Port. The Cargo related charges, payable by Exporters/Importers are levied on the basis of tonnage (MT) of the cargo. The vessel related charges such as berth hire, Pilotage, port dues etc. payable by shipowners, are levied on the basis of GRT of the vessels. Port SCALE OF RATES containing details of Port charges can be obtained on payment from the Traffic Manager, or the Public Relations Officer of the Port Trust. Charter- party holidays as laid down by the Cuttack Chamber of Commerce every year. Annual Rainfall :-(Average) 1480 mm. Maximum Wave Height 5.30 mtrs. Summer: 35 to 42 Km/Hr.